Adam (Youssouf Djaoro) and Abdel (Diouc Koma) are father and son pool attendants working at a hotel in Chad. Adam worries that his son goofs off too much at work and will lose his job, but when the hotel begins downsizing it's Adam who winds up being demoted while his son takes over his old job. At least Adam isn't outright fired like his friend David, the hotel's cook who says, “Our problem is that we put our destiny in God's hands.” Still, it's a serious blow to Adam's pride. Adam barely speaks to his son after his demotion. 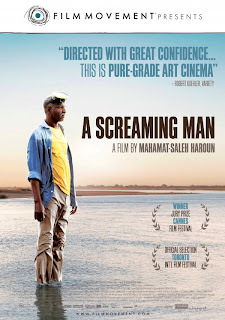 His wife Mariam (Hadjé Fatimé N'Goua) tries to intercede, but the two men ignore her (cleverly visualized by director Mahamat Saleh Haroun by having Mariam wear clothes which so blend into the background as to maker her almost invisible). Eventually Adam makes a decision regarding his son that allows him to get his job back, but not without a considerable cost. This is a straightforward story, beautifully shot and powerfully acted. Djaoro in particular does an amazing job in the lead role. He's got that kind of presence that real stars have, commanding your attention in every scene seemingly without effort. The rest of the cast appear to be a mix of pros and amateurs, but everyone seems just right for their role. Forget that blurb on the poster about this being "pure-grade art cinema". Except for the subtitles, which I know are a deal breaker for some folks, this is a very accessible movie. 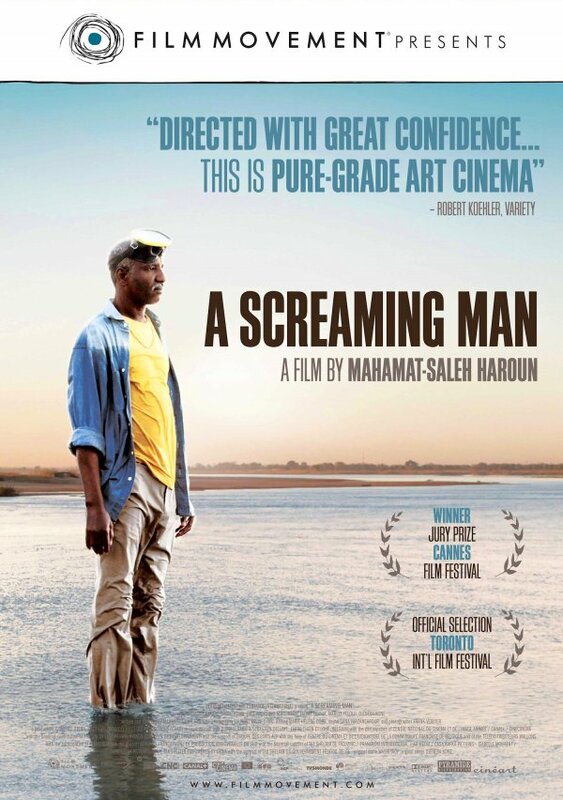 No doubt there are many issues particular to the situation in Chad that A SCREAMING MAN is trying to comment on, but the theme of a father putting himself ahead of his son and paying a price for that selfishness is universal. The character of David also allows Haroun to explicitly comment on his feelings about God and His seeming indifference towards His creation. So while having some idea about the situation in Chad would give one a deeper appreciation for the film, you don't need to know any more than what you're shown here to be emotionally involved in the story. 4 out of 4 stars.